University of Washington astronomy professor Eric Agol is part of the large team of researchers that has just announced confirmation of several Earth-sized, potentially habitable planets orbiting a star about 40 light-years (235 trillion miles) away. 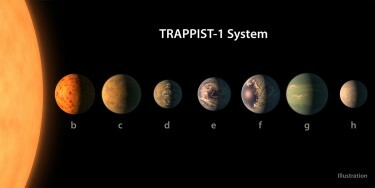 Astronomers with NASA today, Feb. 22, announced confirmation of the first known planetary system with seven Earth-sized planets orbiting a single star, called TRAPPIST-1, in the Aquarius constellation. Three of the planets lie well within the star’s habitable zone, the swath of space around a star just right to allow a rocky planet to have liquid water — necessary for life — on its surface. But all seven could support surface water, given the right atmospheric conditions, according to the research team. Agol helped confirm the approximate mass of the planets using a technique he and colleagues proposed in 2005 called “transit timing variation” analysis, or TTV. 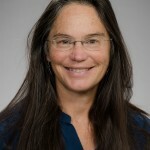 He collaborated on the TTV analysis with astronomers Brice Olivier-Demory at the University of Bern, Switzerland; and Katherine Deck of the California Institute of Technology. This method, Agol said, “uses the fact that as the planets orbit the star and pass one another, they behave like distracted drivers turning their heads to look at one another each time they pass, swerving slightly in their orbits.” The larger the mass of the planets, he said, the stronger their gravitational tugs are on one another relative to the star, and the more significantly their orbits swerve. “This variation can be seen each time the planet transits, or passes the star. Sometimes the planet will arrive early, sometimes late, depending on how strongly it interacted with the other planets during its prior orbit of the star.” The colleagues each analyzed transit times for the planets orbiting TRAPPIST-1 separately, Agol said, and then combined their results. Modeling these variations with Newton’s Law of Gravity, Agol said, the team was able to infer the planet-to-star mass ratio, so that measuring the mass of the star gave them the masses of the planets. The research team confirmed the planets using the NASA Spitzer Space Telescope, the TRAPPIST-South telescope at the European Southern Observatory’s La Silla Observatory and other telescopes around the world. The planets are labeled TRAPPIST- 1b, c, d, e, f, g and h, in order of increasing distance from the cool parent star, a red dwarf. The discovery sets a new record for the greatest number of planets in the habitable zone of a single star beyond the solar system. NASA reports that the planets are so close to each other, people who stood on the surface of one might be able to look up and see geological features or clouds of neighboring worlds, some appearing even larger than the moon in Earth’s sky. Then, he said, they might be able to distinguish whether the planets are rocky with iron — like Earth — or maybe rocky without iron or surrounded by a thick atmosphere or ocean. Lead author of the paper is Michaël Gillon of the University of Liège in Belgium. Gillon also lead a team of astronomers that in 2016 announced the discovery of three planets orbiting TRAPPIST-1. That find inspired the intense follow-up study that resulted in confirmation of all seven planets, due in part to Agol’s work. The large research team includes astronomers from the NASA, the UW-based Virtual Planetary Laboratory and researchers in the United Kingdom, Switzerland, Belgium, France, Morocco, South Africa, Saudi Arabia and the European Organization for Astronomical Research in the Southern Hemisphere. This was adapted from a NASA news release. For more information on the UW’s involvement in this major discovery, contact Agol at 206-543-7106 or agol@uw.edu.